「DOSHABURI」という名に込められた思いは、「心を浄化する激しい雨」というコンセプト。人類は、長い間水というものの影響を受け、DOSHABURI means torrential rain that purifies the soul. 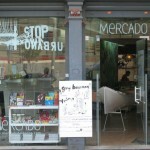 That is the concept of our shop. Just as over time, land and people are effected or sculpted by water, so too our jeans. The jean fabric that has a “worn look” in Japanese also means DOSHABURI. 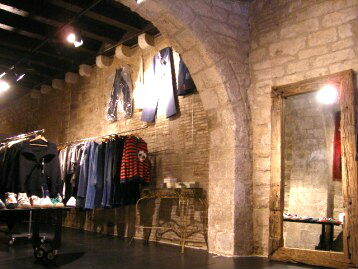 Our shop is part of a restored 14th century palace in the Gothic area (medieval town). 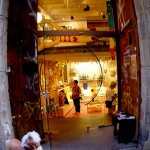 This is the area renound in Barcelona for its richness of culture and european atomosphere. 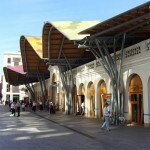 Situated near the Mediterranean sea you find yourself in an intriguing labｙrinth of cafes, museums and shops. Around the next corner is always a surprize, like the corridores of a castle, so different from the hustle and bustle of the outside city. It is down one of those little streets you will find our shop, a sanctuary away from the chaos of modern life, although well connected by modern transport. We have an eye for selection of clothing that have an accent on individualism, mixed with well known, and up and coming brands. We are cosmopolitan Japanese that have lived in the United States and Europe. Our “cross pollination” of tastes and experiences gives a unique touch to our shop. So now you know where we are!! See you soon in Barcelona!